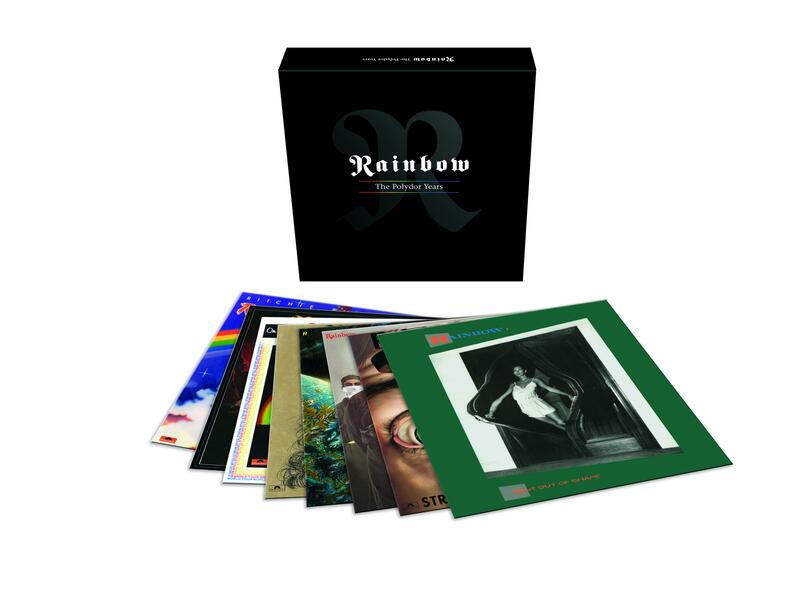 Rainbow - "The Polydor Years"
On November 21st, Universal re-releases the back catalogue of RAINBOW on 180 gr vinyl in the Back-To-Black series. Included are the albums “Ritchie Blackmore’s Rainbow” (1975), “Rising” (1976), “On Stage” (1977), “Long Live Rock’n’Roll” (1978), “Down To Earth” (1979), “Difficult To Cure” (1981), “Straight Between The Eyes” (1982) and “Bent Out Of Shape” (1983). The albums will be released as single LPs as well as a box including all eight releases with a download code for a digital version. As one of the cornerstones of British rock, RAINBOW became a synonym for some of the most popular and well-known rock songs of the 70s and 80s, led by ex Deep Purple member and extraordinaire guitarist Ritchie Blackmore. From the mystical and almost religious “Stargazer“ and “Man On A Silver Mountain“ to the gold anthems “All Night Long“, “Long Live Rock And Roll“ and “Since You Been Gone“ every year in RAINBOW’s decade was shaped by some of the best songs and performances that have ever been put on a record and on stage. Several of the best actors the genre had to offer back then were involved in the band. The singers Ronnie James Dio, Joe Lynn Turner and Graham Bonnet, bassist and producer Roger Glover and drummers Cozy Powell and Bobby Rondinelli – everyone contributed their own individual talent to record some of the classic and most popular albums and singles. 01. "Man On The Silver Mountain"
03. "Black Sheep Of The Family"
02. "The Temple Of The King"
03. "If You Don't Like Rock 'n' Roll"
02. "Run With The Wolf"
04. "Do You Close Your Eyes"
02. "A Light In The Black"
02. "Medley: Man On The Silver Mountain/Blues/Starstruck"
01. "Long Live Rock 'n' Roll"
02. "Lady Of The Lake"
02. "The Shed (subtle) "
02. "Eyes Of The World"
03. "No Time To Lose"
01. "Since You Been Gone"
05. "Vielleicht Das Nächster Zeit (Maybe Next Time) "
03. "Bring On The Night (Dream Chaser) "
05. "Tearin' Out My Heart"
02. "Can't Let You Go"
03. "Fool For The Night"
03. "Drinking With The Devil"